Latin music is a genre used by the music industry as a catch-all term for music that comes from Spanish- and Portuguese-speaking areas of the world, namely Ibero America and Iberian Peninsula, as well as music sung in either language. In the United States, the music industry defines Latin music as any recording sung mostly in Spanish regardless of its genre or the artist's nationality. The Recording Industry Association of America (RIAA) and Billboard magazine use this definition of Latin music to track sales of Spanish-language records in the US. Spain, Brazil, Mexico and the United States are the largest Latin music markets in the world. 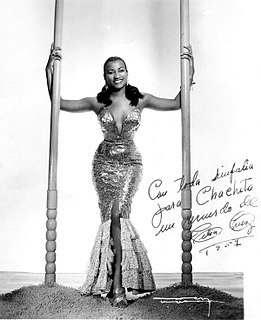 Úrsula Hilaria Celia de la Caridad Cruz Alfonso was a Cuban singer and the most popular Latin artist of the 20th century, gaining twenty-three gold albums during her career. She received a star in the "Walk of Fame" in Hollywood. The U.S. President Bill Clinton awarded her the National Medal of Arts in 1994. She was renowned internationally as the "Queen of Salsa", "La Guarachera de Cuba", as well as "The Queen of Latin Music". Israel López Valdés, better known as Cachao, was a Cuban double bassist and composer. Cachao is widely known as the co-creator of the mambo and a master of the descarga. Throughout his career he also performed and recorded in a variety of music styles ranging from classical music to salsa. An exile in the United States since the 1960s, he only achieved international fame following a career revival in the 1990s. Selena Quintanilla-Pérez was an American singer, songwriter, spokesperson, model, actress, and fashion designer. Called the Queen of Tejano music, her contributions to music and fashion made her one of the most celebrated Mexican-American entertainers of the late 20th century. Billboard magazine named her the top-selling Latin artist of the 1990s decade, while her posthumous collaboration with MAC cosmetics became the best-selling celebrity collection in cosmetics history. Media outlets called her the "Tejano Madonna" for her clothing choices. She also ranks among the most influential Latin artists of all time and is credited for catapulting a music genre into the mainstream market. The Billboard Icon Award was established in 2011 to recognize music singers and contribution. The recipient of the award also performs during the ceremony. The Billboard Latin Music Lifetime Achievement Award is an honor that is presented by Billboard magazine to an artist or a group "for an exceptional career that has taken Latin music to another level globally". From 1993 to 2001, the accolade was presented as "El Premio Billboard". The recipient of the Lifetime Achievement Award is decided by the Billboard editorial committee. The Lifetime Achievement Award was first given to Morton Gould, the president of the American Society of Composers, Authors and Publishers (ASCAP), during the 4th Annual Billboard Latin Music Conference in 1993. Gould was given the accolade for his "contribution to the growth of Latin music in the U.S". The International Latin Music Hall of Fame (ILMHF) was an annual event established in 1999 and held in New York City to honor artists who have largely contributed to the Latin music genre. Luis Miguel is a Mexican pop singer. He is best known for his smooth, crooning vocals and romantic ballads. Luis Miguel has been one of the most popular singers in Latin America since the early 1980s, and is commonly referred to as El Sol de México. Luis Miguel has won four Latin Grammy Awards and five Grammy Awards, and received a Star on the Hollywood Walk of Fame at the age of 26. "Dormir Contigo" is a song written by Armando Manzanero and produced and performed by Mexican singer Luis Miguel. The song is a pop ballad in which the protagonist expresses the joy of sleeping with his partner. It was released as the third single from the album Amarte Es un Placer in January 2000. The track peaked at number 11 Billboard Hot Latin Songs chart in the United States and number two on the Latin Pop Songs chart. Vivo is the third live album by Mexican singer Luis Miguel. It was filmed at the Auditorio Coca-Cola concert hall in Monterrey, Mexico, where Miguel performed from 13 to 17 April 2000, as part of the second leg of his Amarte Es Un Placer Tour. Vivo was released in a live audio CD, DVD and VHS format. Vivo is the first Spanish-language live album to be released on NTSC, PAL, and DVD formats. The audio version was produced by Miguel while David Mallet directed the video album. The audio disc was released on 3 October 2000, while the video album was released on 24 October. Miguel's renditions of "Y" and "La Bikina", which he specifically performed during the concert shows in Mexico where he was joined by Cutberto Pérez's band Mariachi 2000, made available as singles for the album. Universal Music Latin Entertainment, a division of Universal Music Group (Vivendi), is a record company specialized in producing and distributing Latin Music in Mexico, United States and Puerto Rico. UMLE includes famous Latin music labels such as Universal Music Latino, Fonovisa Records, Universal Music Mexico, Capitol Latin, Machete Music and Disa Records. Guatemalan recording artist Ricardo Arjona has released 15 studio albums, sixteen compilation albums, two live albums, forty-five singles and two promotional singles. Four of his albums have reached the number-one position on the Billboard Top Latin Albums chart, while four of his singles have topped the Billboard Latin Songs chart. Throughout his career, Arjona has sold approximately 20 million albums worldwide, making him one of the most successful Latin artists in music history. Arjona released his debut album, Déjame Decir Que Te Amo, in 1985. However, his experiences while recording the album and its commercial failure led to his decision to abandon the music industry. Despite this decision, Arjona returned and released Jesús, Verbo No Sustantivo in 1988. In 1991, Arjona signed a record deal with Sony Music and released his third studio album, Del Otro Lado del Sol. The Billboard Latin Music Award for Reggaeton Album of the Year was an honor presented annually at the Billboard Latin Music Awards, a ceremony that recognizes "the most popular albums, songs, and performers in Latin music, as determined by the actual sales, radio airplay, streaming and social data that shapes Billboard's weekly charts." According to Billboard magazine, the category was "created in response to the growing number of charting titles from the genre" of reggaeton. Reggaeton is a genre that has its roots in Latin and Caribbean music. Its sound derived from the Reggae en Español in Panama. The Billboard Latin Music Award for Reggaeton Song of the Year was an honor that was presented annually at the Billboard Latin Music Awards, a ceremony which honors "the most popular albums, songs, and performers in Latin music, as determined by the actual sales, radio airplay, streaming and social data that informs Billboard's weekly charts." The Billboard Latin Music Award for Latin Rhythm Airplay Song of the Year is an honor that is presented annually at the Billboard Latin Music Awards, a ceremony which honors "the most popular albums, songs, and performers in Latin music, as determined by the actual sales, radio airplay, streaming and social data that informs Billboard's weekly charts." The Billboard Latin Music Award for Latin Rhythm Album of the Year is an honor that is presented annually at the Billboard Latin Music Awards, a ceremony which honors "the most popular albums, songs, and performers in Latin music, as determined by the actual sales, radio airplay, streaming and social data that shapes Billboard's weekly charts." This is a list of notable events in Latin music that took place in 1994. The Billboard Latin Music Award for Hot Latin Song of the Year is an honor presented annually at the Billboard Latin Music Awards, a ceremony which honors "the most popular albums, songs, and performers in Latin music, as determined by the actual sales, radio airplay, online streaming and social data that informs Billboard's weekly charts." The award is given to the best performing singles on Billboard's Hot Latin Songs chart, which measures the most popular Latin recordings in the United States. The Hot Latin Songs chart was established by the magazine in September 1986 and was originally based on airplay on Latin music radio stations. Since October 2012, chart rankings are based on digital sales, radio airplay, and online streaming. From 1995 to 1998, each music genre's field had their own Hot Latin Track of the Year category. The Billboard Latin Music Award for Hot Latin Songs Artist of the Year is an honor presented annually at the Billboard Latin Music Awards, a ceremony which honors "the most popular albums, songs, and performers in Latin music, as determined by the actual sales, radio airplay, streaming and social data that informs Billboard's weekly charts." The award is given to best performing artists on Billboard's Hot Latin Songs chart, which measures the most popular Latin songs in the United States. The Hot Latin Songs chart was based solely on radio airplay since its induction in 1986 until October 2012, when it started to also measure digital sales and streaming activity. In 2010, the category was split into three: Male, Female, and Duo or Group. The Billboard Latin Music Award for Producer of the Year is an honor presented annually at the Billboard Latin Music Awards, a ceremony which honors "the most popular albums, songs, and performers in Latin music, as determined by the actual sales, radio airplay, streaming and social data that informs Billboard's weekly charts." The award is given to the best performing producers on Billboard's Latin charts. The Billboard Latin Music Award for Songwriter of the Year is an honor presented annually at the Billboard Latin Music Awards, a ceremony which honors "the most popular albums, songs, and performers in Latin music, as determined by the actual sales, radio airplay, streaming and social data that informs Billboard's weekly charts." The award is given to the best performing songwriters on Billboard's Latin charts. The Billboard Latin Music Award for Latin Jazz Album of the Year was an honor that was presented annually at the Billboard Latin Music Awards, a ceremony which honors "the most popular albums, songs, and performers in Latin music, as determined by the actual sales, radio airplay, streaming and social data that shapes Billboard's weekly charts". Latin jazz is a form of jazz music which incorporates various sounds from Latin America. 1 2 3 4 5 Lannert, John (May 21, 1994). "The Latin Music Hall of Fame Welcomes Celia and Cachao". Billboard. Nielsen Business Media. 106 (32): 50. ISSN 0006-2510 . Retrieved June 3, 2010. 1 2 Lannert, John (April 29, 2000). "Billboard's Latin Music Hall of Fame Inductee: Marco Antonio Solís". Billboard. Nielsen Business Media. 112 (18): 22. ISSN 0006-2510 . Retrieved April 11, 2014. ↑ "Marc Anthony Among Artists to Appear on 2012 Billboard Latin Music Awards Tonight". BroadwayWorld. April 26, 2012. Retrieved January 21, 2018. ↑ "Honors for Shakira, Sebastian". Billboard. Nielsen Business Media. 118 (13): 10, 68. April 1, 2006. ISSN 0006-2510 . Retrieved September 19, 2014. ↑ Cobo, Leila (April 3, 2004). "El Recodo, Soraya Honored". Billboard. Nielsen Business Media. ISSN 0006-2510 . Retrieved September 19, 2014. ↑ Graybow, Steve; Cobo, Leila (February 15, 2003). "Ramon 'Mongo' Santamaria, 80, dies". Billboard. Nielsen Business Media: 45, 76. ISSN 0006-2510 . Retrieved September 19, 2014. ↑ "Home Front". Billboard. Nielsen Business Media: 6, 56. March 21, 2009. ISSN 0006-2510 . Retrieved September 19, 2014. 1 2 3 Lannert, John (June 10, 1995). "Beloved Selena Enters The Latin Music Hall of Fame". Billboard. Nielsen Business Media. 107 (23): 58. Retrieved April 11, 2014. 1 2 3 "Santana, Daddy Yankee To Be Honored At Billboard Latin Music Awards". Billboard. Nielsen Business Media. March 12, 2009. Retrieved April 11, 2014. ↑ "Maná, José José To Receive Special Honors at 2013 Billboard Latin Music Awards". Billboard. April 23, 2013. Retrieved December 7, 2017. 1 2 "Guerra, Rubio and Juanes lead Billboard Latin winners". The Augusta Chronicle . April 30, 2005. Retrieved December 7, 2017. ↑ Cobo, Leila (April 22, 2016). "Billboard Latin Music Awards Lifetime Achievement Award Winner Marco Antonio Solis Reflects on His Best-Loved Songs". Billboard. Prometheus Global Media. Retrieved December 7, 2017. ↑ Lannert, John (May 4, 1996). "Juan Gabriel Enters the Hall of Fame". Billboard. Nielsen Business Media. 108 (18): L-12. ISSN 0006-2510 . Retrieved April 11, 2014. ↑ Lannert, John (May 3, 1997). "Balladeer José José Enters Billboard's Latin Music Hall of Fame". Billboard. Nielsen Business Media. 109 (18): 26. ISSN 0006-2510 . Retrieved April 11, 2014. ↑ Burr, Ramiro (July 25, 1998). "Hats Off to the Music of Regional Mexican". Billboard. Nielsen Business Media. 110 (30): 49. ISSN 0006-2510 . Retrieved April 11, 2014. ↑ Lannert, John (February 27, 1999). "Latin Notas". Billboard. Nielsen Business Media. 111 (9): 44. ISSN 0006-2510 . Retrieved April 11, 2014. ↑ Cobo, Leila (April 28, 2001). "Billboard's Latin Music Hall of Fame: Mongo Santamaría". Billboard. Nielsen Business Media. 113 (17): 62. ISSN 0006-2510 . Retrieved April 11, 2014. ↑ "Juan Gabriel Cleans Up At Billboard Latin Awards". Billboard. Prometheus Global Media. May 10, 2002. Retrieved December 7, 2017. ↑ "Chayanne, Montenegro Take Billboard Latin Honors". Billboard. Nielsen Business Media. 2003. Retrieved April 11, 2014. ↑ "Latin Music's Brightest Stars Honored at the 2004 Billboard Latin Music Awards". Business Wire. April 29, 2004. Retrieved December 7, 2017. ↑ Cobo, Leila (April 1, 2006). "Honors for Shakira, Sebastian". Billboard. Nielsen Business Media. 118 (13): 10. Retrieved December 15, 2017. ↑ Salomon, Gisela (April 27, 2007). "Barba Dominates Billboard Latin Awards". The Washington Post . Retrieved December 7, 2017. ↑ "Latin Superstars Marco Antonio Solis, Chayanne & Alejandro Fernandez Take the Stage at the 2008 Billboard Latin Music Awards Presented by Heineken". Business Wire. March 25, 2008. Retrieved December 7, 2017. ↑ "Marc Anthony, Los Temerarios To Be Honored At Billboard Latin Music Awards". Billboard. Prometheus Global Media. April 14, 2010. Retrieved December 7, 2017. ↑ "Gloria Estefan, Emmanuel To Receive Special Honors At 2011 Billboard Latin Music Awards". Billboard. Prometheus Global Media. April 13, 2011. Retrieved December 7, 2017. ↑ Gratereaux, Alexandra (April 26, 2012). "Latin Billboards: Marc Anthony To Receive Hall of Fame Award". Fox News. Retrieved December 15, 2017. ↑ Cantor-Navas, Judy (March 31, 2014). "Franco de Vita to Receive Hall of Fame Honor at 2014 Billboard Latin Music Awards". Billboard. Nielsen Business Media. Retrieved April 11, 2014. ↑ "Roberto Carlos and Carlos Santana to Be Honored at Billboard Latin Music Awards". Billboard. Prometheus Global Media. April 3, 2015. Retrieved December 7, 2017. ↑ Fernandez, Suzette (March 31, 2016). "Alejandro Fernandez to Receive Billboard Hall of Fame Award". Billboard. Prometheus Global Media. Retrieved December 15, 2017. ↑ Marti, Diana; Harrison, Lily (April 27, 2017). "Billboard Latin Music Awards 2017: Complete List of Winners". E! Online. Retrieved April 27, 2018. ↑ Marti, Diana (April 26, 2018). "Billboard Latin Music Awards 2018 Winners: The Complete List". E! News. Retrieved April 27, 2018.